As K-12 schools in BC work to Indigenize curriculum and Canadian post-secondary institutions respond to the TRC’s Calls to Action to promote, recruit and support increased Indigenous research and teaching, the following three Indigenous scholars in the University of Victoria’s Faculty of Education are available to provide context and comment on the challenges and most promising practices in Indigenous education. Paul Whitinui (Maori from Aotearoa-New Zealand), Onowa McIvor (Swampy Cree and Scottish-Canadian from Northern Saskatchewan) and Carmen Rodríguez de France (Kickapoo Nation from NE Mexico) are Indigenous scholars in UVic’s Faculty of Education. They are co-editors and contributing writers of a new book about Indigenous education: Promising Practices in Indigenous Teacher Education. Other UVic authors among the 47 contributors to the international collection are: Catherine McGregor, Trish Rosborough and Aliki Marinakis. 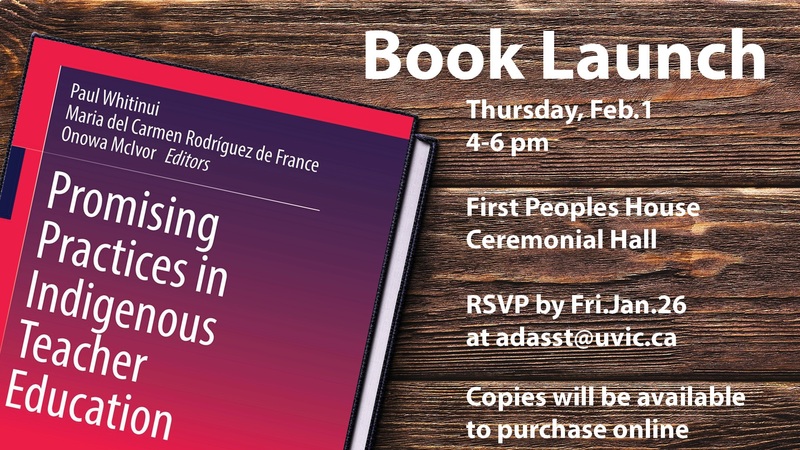 NOTE: All the UVic contributors will be present for the book launch at First Peoples House at UVic, Feb. 1 from 4 to 6 p.m. Media are welcome to attend. Please contact Suzanne Ahearne for more info. Q? What does it mean to “Indigenize the academy” and what are the challenges and promises associated with this? A. Paul Whitinui: “Indigenizing” the academy is a challenge and an opportunity for many working in post-secondary settings. It’s a challenge, because the academy was built on a legacy of colonization that dispossessed many Indigenous peoples and displaced them from their traditional lands, languages and lifestyle. Indigenous peoples in Canada are hopeful that the Truth and Reconciliation Commission’s Calls to Action will usher in a new era of Indigenous-led success. Indigenous peoples, however, know only too well that Indigenizing the academy is not only about decolonizing the academy; it’s also about Indigenous peoples self-determining and engaging in the process of shaping their own educational futures. Indigenizing the academy requires a high level of culturally inclusive leadership and, at the same time, developing culturally relevant and appropriate curriculum. In this regard, Indigenizing the academy is a transformative act requiring a mind-shift toward seeing Indigenous peoples as leaders in education, rather than as mere recipients of it. Q? What is community-based Indigenous language teacher education and why is this model showing the most promise for language revitalization? A. Onowa McIvor: For communities who are rebuilding their language, this work inevitably begins in their territory, with their speakers, on their land, with their people. We have come to understand that two to three years of highly intensive language learning experiences are necessary for beginners to become speakers of the language. This is a necessary foundation for Indigenous people to begin their training as teachers in the language. Becoming a teacher in an Indigenous language school requires at least an intermediate level mastery of the language. After those first years, universities can play a role in furthering language teacher education, and we are finding innovative ways to continue supporting their language learning journeys while they continue to become certified teachers. Q? What are some of the most promising practices in Indigenous teacher education? A. Carmen Rodríguez de France: Across Canada and around the world, teacher education programs are recognizing and acknowledging the value of Indigenous ways of being, doing, knowing, and relating to others, including to the land. When practicing teachers and pre-service (student) teachers are more knowledgeable about the histories, experiences, and contributions of Indigenous people, they are able to relate better to Elders in communities, to engage with parents and their students’ families. Countries like Canada, Australia, Mexico, and New Zealand are contributing to this by creating innovative and engaging programs, courses, and initiatives that strengthen the ways of knowing and being of their Indigenous peoples. Q? What are some of the gaps in Indigenous teacher education in K-12 BC and how are they being addressed? A. Paul Whitinui: There are two kinds of gaps—tangible and intangible. There are real achievement gaps between Indigenous and non-Indigenous students in every school in BC. That’s being addressed by creating new programs and initiatives to improve and enhance educational outcomes, enabling Indigenous students to feel confident and capable of taking up post-secondary education. To address the intangible gaps, schools and teachers need to listen better to the voices of Indigenous families and work together to raise the expectations of Indigenous students so they can be successful—socially and academically. It also requires that schools and teachers shift from a focus on deficits and under-achievement, to develop better educational pathways for Indigenous students to enjoy and achieve educational success.